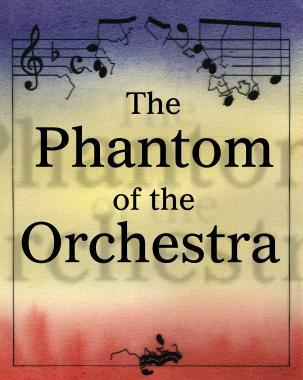 What is The Phantom of the Orchestra? How do I get a perusal score? What does the rental of the show include? How do I produce it? check out the fabulous score and parts that come with the rental! The Phantom of the Orchestra is a one-hour family and pops concert piece for orchestra and four actors. This is one of several "produce-it-yourself" family concert packages from Justin Locke Productions. The purpose of these programs is to provide orchestras with an easily produced program that introduces children to classical music while keeping their parents entertained as well. The music for this program is from the standard literature. The program includes music of Bach, Mozart, Beethoven, Massenet, Tchaikovsky, and others. The Phantom of the Orchestra is the story of a shadowy being who lives in an empty concert hall. But his peaceful existence is invaded by . . . an ORCHESTRA. Their incessant playing of loud music drives him insane, and so he sets out to destroy the orchestra by fair means or foul (teaching us a great deal about how an orchestra works on the way). The minimum orchestration for Phantom is "Mozart Plus Harp," i.e., strings, double ww's, 2 horns (optional 4), 2 trumpets, harp, 2 perc. However, I recommend (and most clients seem to prefer) doing the full version with 4 horns, 4 tpts, tbns and tuba. All rentals of the show include a score and complete set of parts. The parts are fabulous; all GBC bound, with all the stage cues on the left page and the music on the right page! "Phantom" has been done by the Pro Arte Chamber Orchestra of Boston, the Phoenix Symphony, the Southeast Iowa Symphony, the Elgin Symphony, the Buffalo Philharmonic, and is regularly done in Poland by the "Speaking Concerts" group. It was also done in an expanded version in the Theatro Municipal in Rio de Janeiro. Usually, Phantom is done in collaboration with a local theater group. Technical requirements are minimal. The advantage of renting this program is you have control over schedule and quality without having to worry about a touring performing group. It has been done with actors of all ages. Professional Orchestras can do it with one 3 hour rehearsal. This piece is a little more challenging to stage than Peter VS. the Wolf, as it includes singing, a bit of choreogaphy, a chase scene, and lots of visual/physical comedy. But while it is a little more challenging, in the hands of a competent stage director it can be a lot of fun for performers and audience alike. Email me at justinlocke1@gmail.com for a quick quote.